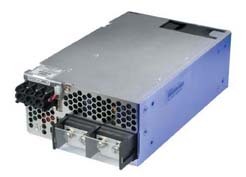 TDK-Lambda Series SWS are single output power supplies available from Kepco in 50W, 75W, 100W, 150W, 300W, 600W and 1000W sizes. They are enclosed, low cost, industrial grade and suited for general purpose applications. All sizes feature nominal voltages of 3.3V, 5V, 12V, 15V and 24V. Additional nominal voltages are available as follows: SWS150: 18V; SWS300A: 4V, 7.5V, 36V and 48V; SWS600: 36V and 48V, SWS600L and SWS1000L: 26V, 48V and 60V. All models employ power factor correction to EN61000-3-2 and input transient protection per IEC 61000-4. They feature universal input (85-265V a-c), global safety approvals and level B EMI compliance. Kepco offers full service power solutions, including other add-ons such as mounting brackets, special harnesses and cabling, as well as packaging different power supplies into a single multi-output power assembly. Contact Kepco for more information.